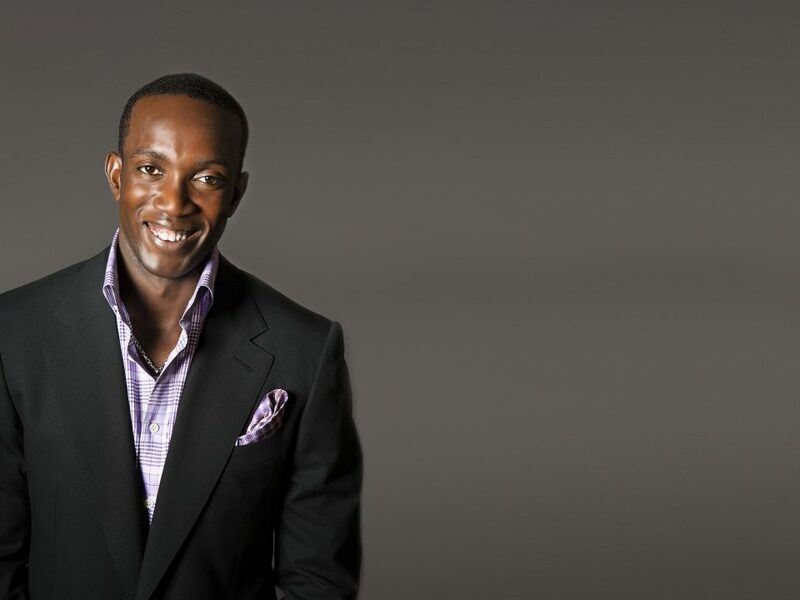 The man formerly known as Tommy Docherty is almost certainly not the only one to have doubted what Dwight Yorke was capable of. To simply say Yorke was plucked from footballing obscurity is missing a good chunk of the story. Already identified as a future star in his mid-teens, Yorke was scoring in front of five-figure crowds for his school team – and enjoying every aspect of the attention it brought. Back on the pitch, a 17-year-old Yorke took advantage of the serendipity that was Aston Villa being knocked out of the FA Cup early by holders Wimbledon. With a fortnight to fill, Graham Taylor brought his squad for a couple of kickarounds and a chance to relax in Trinidad & Tobago. During the second of those games, Villa asked if Yorke could pull on their shirt for the second half – the proposal was flatly turned down by the Tobagonian XI, but a further invitation of a month’s trial over in England was soon extended. 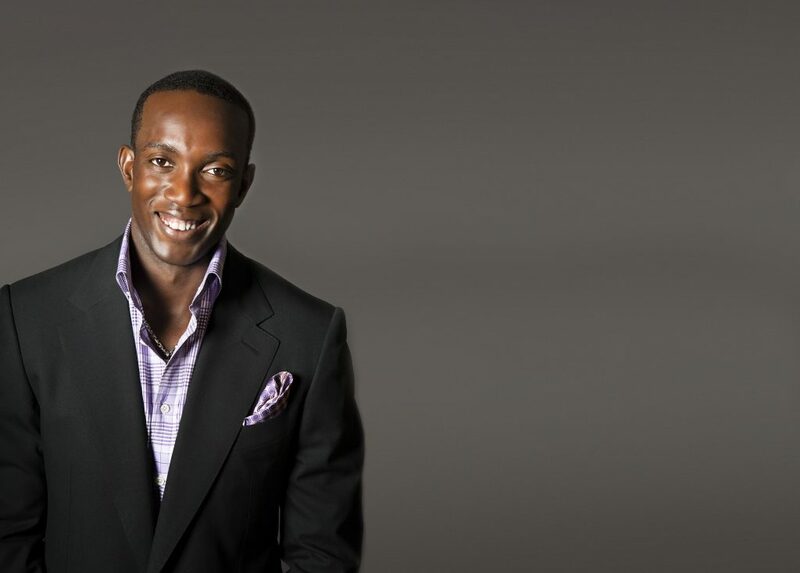 Yorke stepped off the plane at Heathrow with Tobagonian teammate Colvin Hutchinson and both felt an immediate culture shock: the coldness, the rain, the long drive to Birmingham, “beans on toast until we wanted no more”. By November 1989, Hutchinson had quietly been sent home, and Yorke – work permit in hand – was ready to settle into life as a First Division footballer: a startling early-career trajectory levelled off only by “the shot heard round the world”, a 30-yard looper from Paul Caligiuri in Port of Spain that meant the USA would go to the World Cup instead of an “inconsolable” Yorke and the ‘Strike Squad’. 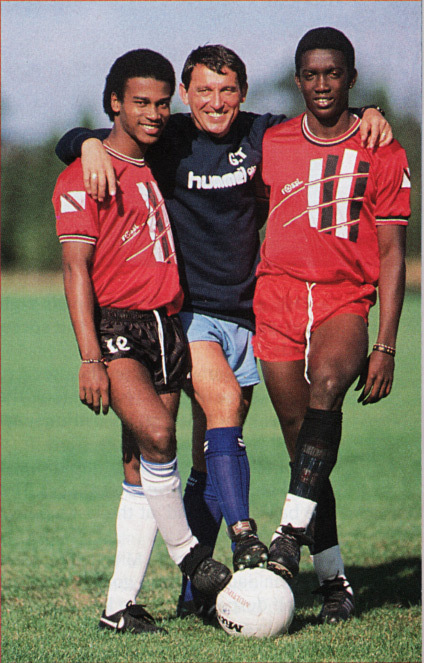 Yorke at right with Graham Taylor (centre) and fellow Tobagonian Colvin Hutchinson. Taylor, in his charmingly misplaced wisdom, decided to help Yorke acclimatise by housing him with the family of winger Tony Daley – “it was a reasonable assumption on Graham’s part but Tony’s family heritage is Jamaican” – until the teenager was taken in by a couple called Sheila and Bryn in a small village called Shustoke. “I loved it…[it was] how I imagined England to be,” Yorke recalls. An uneventful full Villa debut for Yorke at Old Trafford, of all places, inspired Docherty – who had managed both clubs – to write his immortal, dismissive words in a newspaper column. But Yorke persisted, even if his managers didn’t. Taylor left for England in 1990, and his replacement Dr Jozef Venglos lasted just a season – long enough to witness Yorke’s first goal in English football, and a celebration stolen shamelessly from Italia ‘90. After the failed experiment of Venglos, in came Ron Atkinson – “this crazy guy” – and Yorke finally found some momentum, scoring 16 times in the 1991/92 season until a serious thigh injury struck. Some intermittently sparkling performances on Villa’s left wing over the next two seasons were followed by Yorke’s next big disappointment while on the cusp of the big time: Atkinson left him out of the squad to face Manchester United in the 1994 League Cup final. The 22-year-old “was so disheartened I felt like packing it all in and going back to Tobago”, only to be given yet another new lease of life when Brian Little took over halfway through the following campaign. Having finally come to terms with the physical demands of the Premier League – Yorke recalls barging over Colin Hendry on a cold February night in 1996 as his breakthrough moment in that respect – the wide man was about to become Villa’s main man. Little – a well-regarded former Villa striker whose career had ended at 26 with a knee injury – had assured Yorke he would be the team’s “number one striker”. Having only broken into double figures once in his six seasons since arriving, there were few guarantees that a winger in his mid-20s could become a Premier League goalscoring force. Brian Little’s first full season as manager in 1995/96 duly coincided with the fulfilment of his promise: Yorke played 48 times and scored 25 goals. Most importantly, he was undroppable for Villa’s next Wembley visit – the 1996 League Cup final against Leeds – and he backed that up with an emphatic finish. Meanwhile, Yorke hit another 20 goals in 1996/97 and top-scored for Villa for a third time in a row the following season, by which time John Gregory had taken over from Brian Little – Yorke’s fifth permanent manager at Villa Park in little over eight years. Stan Collymore had also since arrived for £7m – offering the potential of an attacking trio alongside Yorke and Savo Milosevic – but it was becoming clear to Villa’s erstwhile “main man” that the grass may be greener on the other side. Before whispers of Alex Ferguson’s interest amount to anything, there was an offer from Atletico Madrid, whose £1.3m-a-year deal needed only Yorke’s signature. Manchester United were galvanised into action. Doug Ellis, the Villa chairman, made an even better counter-offer to keep Yorke where he was. United’s £9m move for Patrick Kluivert from Milan ran aground, as Ferguson lost patience with the Dutchman’s hesitation over moving to Manchester rather than a London club. Relieved to have survived his manager’s Second Amendment rights, Yorke had already signed off in audacious style, clipping a premium Panenka over the head of David Seaman at Villa Park to secure his teammates European football for the following year. Yorke’s sights were soon set higher than UEFA Cup ties against Strømsgodset, though. In doesn’t take 20/20 hindsight to conclude that the 1998/99 season wasn’t a bad time to be arriving at Manchester United, but Yorke was under pressure to hit the ground running. He certainly did that: 26 goals in his first 36 games represented the sort of career gear-change that his £12.6m fee would have demanded. A brace on his Old Trafford debut against Charlton was a fine start, and an early showcase of the sort of service on offer from the right boot of David Beckham. The same combination brought about Yorke’s first goal in the Champions League, against Bayern at the Olympiastadion, at the start of a belting group stage in which United had already drawn 3-3 at home to Barcelona and would go on to score 20 times before the knockouts had even begun. The inherent pressure that came with his substantial, club-record transfer fee was compounded by the competition up front: United boasted one of the most balanced, multi-purpose strikeforces the Premier League had ever seen in a peak-era Teddy Sheringham, the relentlessly reliable Ole Gunnar Solskjaer, Andy Cole (who had scored 25 goals the previous season) and now Yorke. Ferguson took his time to find the right regular combination, but they dovetailed almost instantly. By the start of October, Yorke and Cole had started together only once – a goalless draw at Upton Park, after which Cole had either been benched or left out completely as Yorke scored four times in his first seven games. United travelled to Southampton – which had been something of a high-profile banana skin for them – and Ferguson decided to “freshen things up” by pairing £20m worth of his attacking stock. Within 11 minutes, Cole had provided Yorke with a goal. That was the first admiring glance in what turned out to be a partnership for the ages. Such was their instant affinity, The Observer was comparing them within weeks to Keegan and Toshack, Morecambe and Wise and Lennon and McCartney. It was an understanding that has passed so deep into modern legend that even they tend to lose track of the finer details. “We were totally different,” Cole told FourFourTwo recently. “Dwight was, ‘Look at me, I play for Manchester United, I’ve got a nice bird and car.’ I’m the opposite.” Cole’s account differs slightly from a 2013 interview with the Times’ in which he and Yorke fondly recall twice buying the exact same models of Mercedes and Ferrari in the same colours and with near-identical number plates. Their defining moment of telepathy – a rather grand, overused term for what Cole and Yorke nevertheless insist was a natural understanding, rather than a training-ground construction – came against Barcelona at the Nou Camp. Another 3-3 draw, but this time Barca were doing some serious chasing. A backline of Albert Celades, Michael Reiziger, Sergi and Samuel Okunowo (whose career would take him to Waltham Forest in the Isthmian League a decade later) may not be one for the Barcelona club museum – and Yorke and Cole’s one-two (and three and four) had them flailing around on their own turf. “The odd time, we would even be wearing the same boxer shorts,” Yorke helpfully adds, revealing the finer details of a partnership between two friends born just 19 days apart. One can only imagine what the joint birthday parties were like, especially if Mark Bosnich was in charge of the planning. That the two would draw a blank in the crowning moment of United’s Treble season back at the Nou Camp against Bayern Munich is a mere footnote – Sheringham and Solskjaer more than deserved their chance to apply their historic finishing touches – and, for Yorke, the night was perhaps even more significant than for his international superstar teammates. After coming so close to Italia ‘90 as a teenager – and then falling far short of USA ‘94, France ‘98 and Japan/Korea 2002 during his peak years – a 34-year-old Yorke, deployed in a deep midfield position, would finally get his chance in 2006. Yorke’s staying power – as Lynne from Tamworth might testify – should never have been questioned. Yorke’s perfectly-formed 1990s narrative – from being on the wrong end of prank phone calls from David Platt as he shivered at Aston Villa to lifting the European Cup with one of the greatest English teams ever assembled – was bookended with surely his greatest honour of all. 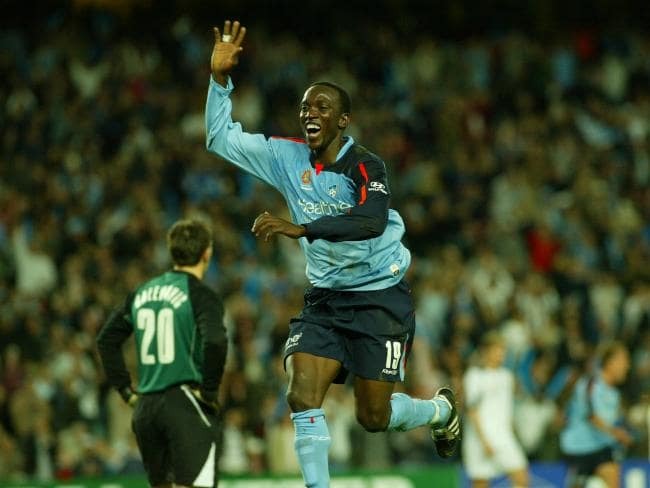 Dwight captained Sydney FC to championship glory against Central Coast Mariners in the first year of the competition in 2005-2006. The former Manchester United great – who made 21 appearances for Sydney as its $1 million marquee maestro .”I have incredible memories of my time with the club and to set up the winning goal in the grand final for Steve Corica (now a member of Sydney’s coaching staff) was nice. “It was an amazing time to play my part in putting the A-League on the sporting map in Australia and taking the game forward. Having famously won the European Cup, Premier League and FA Cup treble with United in 1999, Yorke found his way to Sydney after subsequent spells with Blackburn and Birmingham and went on to skipper Trinidad and Tobago at the 2006 FIFA World Cup in Germany when he departed Australia. Playing in midfield, the ever-smiling Yorke still scored seven goals and adorned the social pages almost as often as the back pages a he cut a swathe through Sin City. His crowning glory against the Mariners was also his last match for the club as the Sky Blues sought to rein in their spending in season two of the competition. The game is still fresh in his mind as he looks back nostalgically. “I remember threading the pass to “Bimbi” (Corica) and he did the rest … I know what it feels like to capture an A-League title and hopefully the current Sydney players will have that same feeling on Sunday,” said Yorke, now a TV pundit. 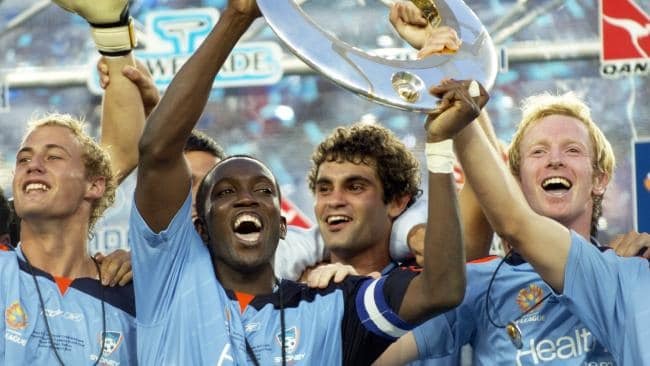 A surprise omission from the PFA’s recently named A-League Team of the Decade – where fellow former Sydney FC star Alessandro Del Piero only made the bench – Yorke believes the marquee concept must remain a part of the fabric of the competition. “It’s all about attracting the best talent and giving fans something out of the ordinary and that’s where players like Del Piero come in,” he added. “There was always that element of doubt when I came to Australia (aged 33) that I would deliver that marquee fire. “I was that glamour guy coming in and that’s all well and good … but I feel I produced also and I was grateful that I played alongside a bunch of guys how believed in what I was trying to achieve. “I was happy to be given the opportunity to start the trend. Australia is a country with a great sporting tradition and has produced greats like Mark Viduka and Harry Kewell who made their names aboard. While pointing out the lure of the MLS and now Asia as big draw cards for star players nearing the ends of their careers, Yorke wouldn’t hesitate to recommend the A-League also as a football destination. Yorke spent two years at Blackburn Rovers, where he rejoined his old United strike partner, Andy Cole. He managed 13 goals in his first year at Blackburn helping them finish 6th and qualify for the UEFA Cup, the following season he was in and out of the team. He joined Birmingham City in 2004 on a free transfer. Yorke started his Birmingham career well with a goal on his home debut against Charlton Athletic which went a long way in winning over fans owing to his lengthy association in the past with city rivals Aston Villa. He scored again against Graeme Souness’s Newcastle in October. He left the club after eight months. On 31 August 2006, Yorke’s transfer to Sunderland was announced. The transfer for a fee of £200,000 re-united Yorke with ex-teammate Roy Keane then manager of Sunderland. He at one time played alongside countrymen Carlos Edwards and Stern John. Yorke made his debut in the home match against Leicester City and received a rapturous standing ovation from home fans when he came on as a substitute in the first half. Yorke was used as a defensive midfielder rather than his usual striker role.He scored his first goal for Sunderland in the 2–1 loss against Stoke and was accepted by the people of Sunderland, switching on the city’s Christmas lights in 2006. He was handed the number 19 shirt at Sunderland, the number which he wore at Manchester United and Sydney. On 1 July 2008 Yorke signed a new one-year contract to stay with Sunderland for the 2008–09 season. He was named man of the match for his performance against on 4 October 2008, with Sunderland drawing 1–1 at home. Following Keane’s departure from the post of Sunderland manager in December 2008, Yorke and Neil Bailey were named as assistants to Ricky Sbragia Ricky Sbragia. Yorke departed the club at the end of the 2008–09 season.